STOP working through the beautiful sunsets right out side my door – they are too beautiful to miss! To learn more about creating a foundation of self-love, join us at the LOVE CLUB! 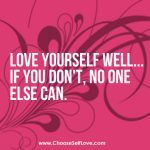 Hi Christine, Thank you so much for challenging us to practice better self love, I am always encouraged by your e-mails and video messages, wishing you lots of love and joy in 2015. Thank you Rhonda – receiving the love! START by totally committing myself to transforming my fears to LOVE by listening closely to my heart whispers. STOP listening to the idle chatter of “not being good enough” from myself and others. Continue to welcome all the spiritual assignments that come my way that allow me to choose LOVE first. Start exploring the hobbies that I keep meaning to get around to, and maybe a few others too until I find one that I am passionate about. Stop wasting my time mindlessly sitting on the couch vegging out. Even though I can be tired at the end of the day moving makes me feel better. START feeling safe in my own life, that I will be provided for in my work, relationships and home. STOP being triggered by people who do not deserve energy from me, and create negativity and lower my self love. CONTINUE to grow and learn in my ability to self care and believe in myself. I love your videos and am excited to be a part of the Vision call next week. You continually bring me back to centre and give me inspiration – thank you. I am choosing to start focusing on my health and wellness business to bring knowledge and inspiration to those that want it. 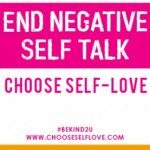 I am choosing to stop negative self talk – I need to let go/ignore of the “room mate” in my head. I am choosing to continue my spiritual journey with more intention and passion. Christine, thank you for this relaxed way to ease into the new year. I choose to experience traveling this year. I choose to stop letting my ego dictate so much of my life. I choose to continue exploring my creativity through a variety of mediums of art. I desire to start living in a state of clarity. I desire to start rebuilding, watering my friendships so that they can bloom and regrow. I desire to stop living in fear and making excuses of why I can’t make a career change. I desire to continue improving myself through personal development workshops, self-love seminars, classes to develop new skills etc. I desire to continue improving myself but narrowing it down to one topic a month instead of being all over the place and focusing on learning to many new things at one time. 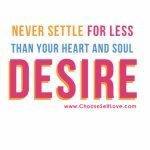 thank you beautiful Christine for the self love blog i am so excited to be choosing my self love devotions for 2015 today and throughout this month! I choose to stop; cluttering up my environment and to relesase my tendency to procrastinate and feel less then in my efforts to dream big. I choose to continue; loving this man and his family, to grow my therapy business, to keep exercising- swimming, playing, swinging, walking, hiking etc…to continue building and embracing my spiritual community of men and women, and to travel and learn from others. I choose me before we and I choose LOVE LOVE LOVE…. I choose to start…. a new awesome & blessed chapter in my daughter’s & my life. Move to a warmer place with a fabulous job & my daughter to start a new school she loves & does great at with new friends & loving our new lives. Staying connected to the supportive awesome loving people already in our lives. I choose to stop….trying so hard for other peoples approval and staying in relationships that don’t fill me up too. I choose to continue….meditating, going to church, connecting to God & bonding with my beautiful daughter. Things that do fill me up. I choose to start loving myself more. Have more faith in my path. Make time for myself to do things I enjoy..like painting, guitar, yoga, and meditation. Relax and enjoy myself more and remember I am good enough as I am. Loving others more without attachment & conditions. I choose to.. Stop drinking for a social life and having “fun.” Stop worrying about my past and my future.Stop worrying so much period. Stop eating gmo foods and meat that comes from farms that hurt animals..food that is toxic to my body even when it’s common. Stop feeling unworthy and believe I am worthy of good things. Stop listening to music/watching TV that also isn’t a good influence on myself and others. And stop beating myself up for my flaws. Stop being afraid of sharing who I am if it doesn’t mirror what others think. I choose to continue to detox my body of toxins with the MC..meditate, have gratitude, walk my puppy, read books that feed my soul with truth, hope, love, and courage and watch Gaiamtv.com that does the same. And continue to smile even though it gets hard and the world isn’t being lead by those creating safety and truth…do what I can to create that and forget all the hype that leads people away from what really matters.. Love, truth, and justice. In devotion to myself, I choose to start loving, accepting and integrating every part of me – from the heroine who can do anything to the frightened little girl who needs reassurance. 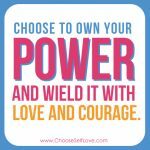 In devotion to myself, I choose to STOP criticizing myself and doubting the amazing power of self-love. In devotion to myself, I choose to continue searching for the ways I can contribute creatively to the world, to make me – and others – healed and happier. I want to start being artistic and creative. I want to stop/diffuse my negative self-talk by understanding that these thoughts come up to protect me, but they are not ultimately serving me. I want to continue to give myself permission to practice self-care through nourishing books, workshops, chai lattes, dark chocolate and the like. Thank you Christine!! Happy 2015!! Start practising yoga, to keep myself centred as often as possible, to learn to relax into myself, love my body and be amazed at what I can do! 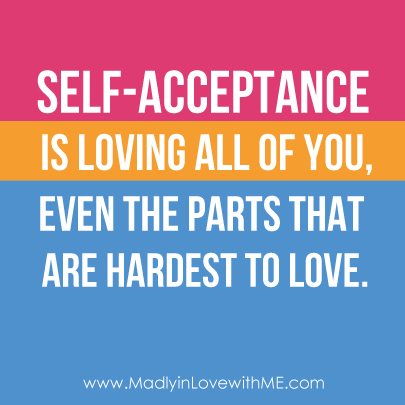 Stop looking outside of myself for love and acceptance – toxic relationships are not good for me! Continue to love Life, be grateful, own my choices and grow! Start: Being the love I want to attract and doing more of the things I enjoy. Stop: Feeling guilty for taking time for me. Continue: Yoga, filling my spirit, and connecting to my heart and intuition. 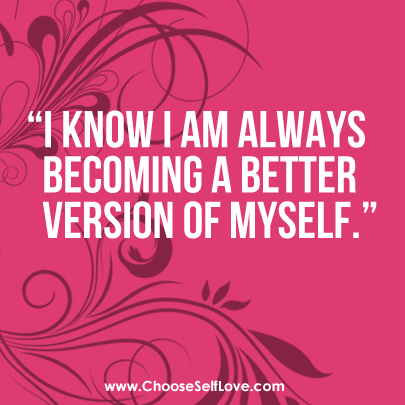 In devotion to myself in 2015, I choose to start loving myself more and not always being a people pleaser, so making me #1. Stop fear by breaking through the terror barriers at every chance I can. And continue my spiritual growth, learning and loving more, and my daily gratitude. Btw, thank you Christine for your inspiration! Start: my creative childrnes books project which I set inn motion in January and finish writing my e book; Stop: inappropriate and /or toxic relationships (they are mostly gone, but I have hung onto one and I relize this is due to not wanting to disappoint them…OVER THAT! ); Continue: The expansion of my dog training business into ownership of a well known training store, belly dancing lessons because it shakes up my creative self, energizes me and feeds and nourishes my soul, growing my self love branches! I choose to start a best friendship with a male. I choose to stop comparing myself to others. I choose to continue exploring my artistic nature. I choose to START focussing on my wonderful shamanic coaching project called “Heilbegleitung” by offering juicy offerings on my brand-new website. I choose to CONTINUE feeling my deep connection to every being on earth and just enjoying this wonderful journey on planet earth. Blessings for all of you goddess women! Thank you so much, Christine, for being the beautiful, wonderful woman you are and for sharing your wisdom, energy, and love! I choose to stop running away from things that scare me. I choose to continue working on my website, doing my YouTube videos, expanding my business, being open to receive, and loving myself. Hello Christine and a Happy, Loving New Year! -Continue to connecting to my wondrous womb space and acting from there as a powerful woman! I desire to get stronger,eat healthier foods,think healthy thoughts,find & wear comfortable shoes. I desire to stop eating lots of carbs which ultimately turn to sugar in my body(bad). I desire to continue my journey of rejuvenation which I started in 2014, & my sacred connection with God & with Christine’s messages to my heart. Thanks! Start living my life based on my own desires and needs rather than trying to make other people happy, and catering to what I believe others expect of me. I choose to start believing in the power of my dreams again. Stop succumbing to the negativity of my own thoughts and the negative energy of those around me. I choose to stop being scared of the future and the possibility of failure. Continue to find solace in my meditation practice and listen to the divine within to help guide me on the next stage of my journey. Thank you Christine for this thought provoking exercise!! My answer surprised me. I choose to start loving (a man). I choose to stop stressing. And I choose to continue loving myself. I wasn’t going to post here but I kept feeling nudged, so. . .